Mild to moderate levels of unicompartmental osteo-arthritis of the knee, post Meniscal Repairs and post Micro-fracture surgery. 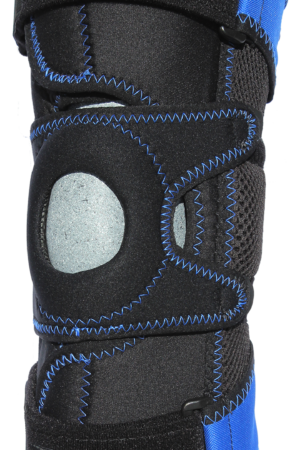 The wrap around, single hinged and removable skarkskin patella buttress design addresses OA and secondary patella tracking issues. The low profile, pre-set 7 degree offset NOS hinge provides OA relief that comes pre-set at 20 degree extension. Brace comes with a stop kit and a condyle spacer pad for added correction. Thigh and calf paddles with lock down straps provide exceptional counter force without sacrificing comfort. The removable, sharkskin designed patella buttress is patent pending. Plus interior sharkskin lining helps prevent migration. The wrap around OA Brace is 14” and weighs 14 oz.